2.The Amount of BBB Rated Debt Outstanding is Now Larger Than the Combined High Yield and Leveraged Loan Indices..Barclays. 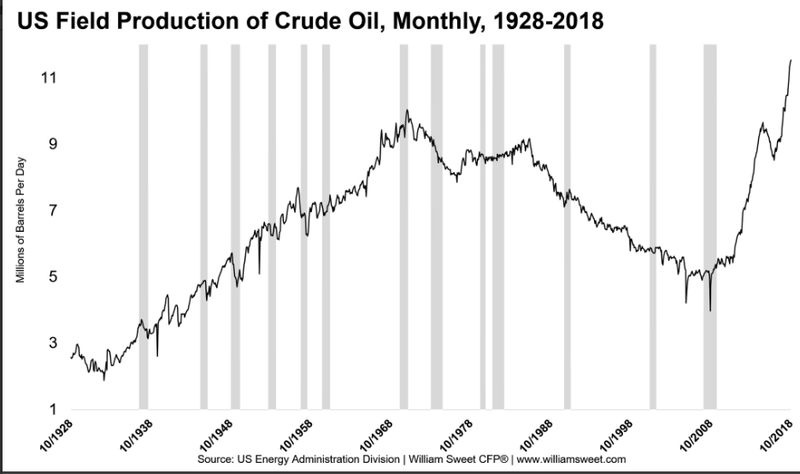 If you told someone in 2008 that over the next 10 years, US crude oil production would 1 – reverse a 20+year trend of decline AND 2 – increase by 225% would they possibly believe you? 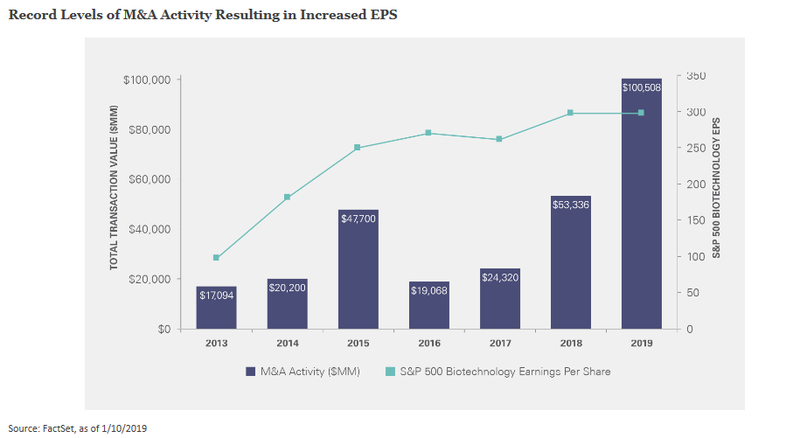 4.Small Caps Off to Strongest Start in 32 Years. 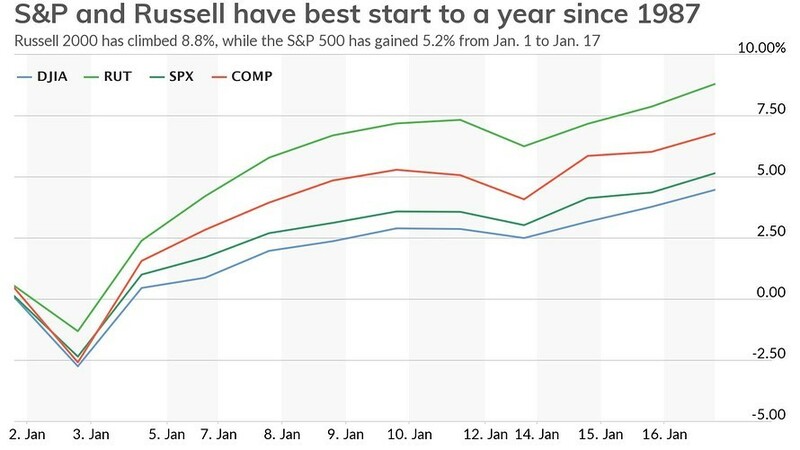 Small-cap stocks, as gauged by the Russell 2000 index RUT, +1.04% , are off to their best start to any year in the past 32 years, boasting a gain of 8.8% over the past 12 trading sessions, according to Dow Jones Market Data. That’s outpacing the large-cap S&P 500 SPX, +1.32% the U.S. stock-market benchmark, which is up 5.2% over the same stretch — a performance, however, that likewise is the strongest 12-day start to a calendar year in 32 years. 5.Watching Euro Banks—UBS Earnings -5% Pre-Market. 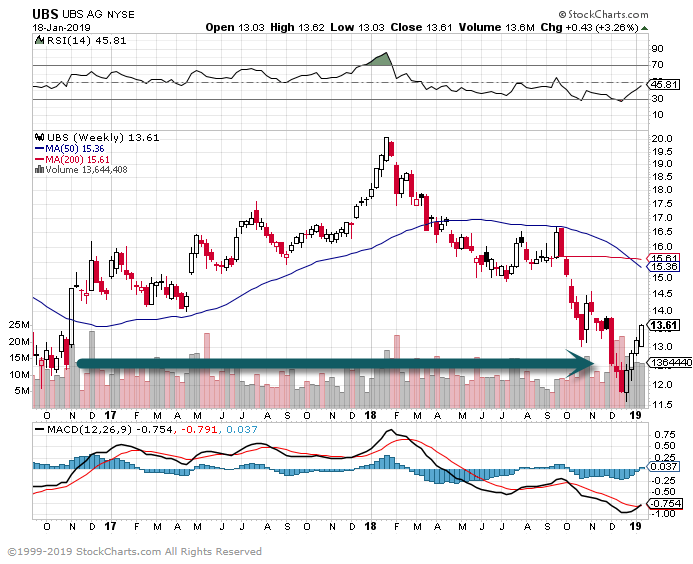 UBS almost cut in half from top in 2018…see if it bounces by end of day. in China dropped to the lowest level in almost 60 years in 2018, signaling the country’s looser two-child policy has done little to reverse its slowing birthrate, and worsening the outlook for growth in the world’s second-largest economy. The demographics stand to fuel concerns about China’s economy, which is on a long-term slowing trajectory even as signs of stabilization suggest efforts to cushion its deceleration are taking hold. China’s expansion was the slowest since the 2009 financial crisis last quarter, as the government grapples with a debt cleanup and ongoing trade war with the U.S.
Signs of a steep drop in birth numbers had already emerged, as China’s major cities disclosed their birth figures for 2018. Wenzhou, a manufacturing hub and wealthy coastal city, saw its birth number drop to the lowest level in 10 years. A neighboring city, Ningbo, estimated births declined by about 17 percent. A top Chinese research institution projected the population could start shrinking as soon as 2027 — three years earlier than expected — if the birth rate held steady at 1.6 children per woman. The population — at 1.39 billion in 2017, and the world’s largest — could fall to 1.172 billion by 2065, it said. Monday’s figures are the lowest since the turmoil of Mao Zedong’s Great Leap Forward, during which China’s aggressive push to develop industrial power resulted in widespread famine. The total population fell by 10 million in 1960, with a large number believed to have starved to death. In 2016, China eased its family planning policies to allow parents to have as many as two children, instead of one. The nation’s parliament struck “family planning” policies from the latest draft of a sweeping civil code slated for adoption in 2020, the clearest signal yet that the leadership is moving to end limits on the number of children families can have. The country’s infamous “one-child” policy left China with a worker shortage and an aging population comprised of some 30 million fewer women than men. China’s State Council last year projected that about a quarter of its population will be 60 or older by 2030 — up from 13 percent in 2010. China’s labor force fell by 4.7 million in 2018 — the seventh consecutive year of decline. 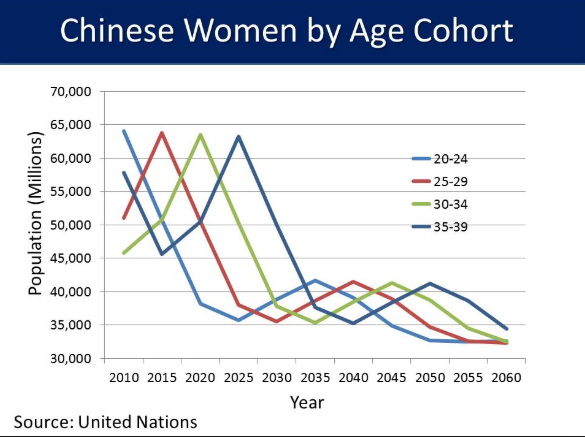 “As the number of fertile women is expected to continue to decline in the years to come amid a decreasing willingness to bear children, China will continue to see its birth number decline,” He said. You don’t have to be an Eagles fan–or even a football fan–to appreciate this lesson. Late last year, Philadelphia Eagles backup quarterback Nick Foles took over for injured starting quarterback Carson Wentz when he suffered a torn ACL. Many believed the Eagles’ Super Bowl hopes had been devastated. But Foles proved otherwise, as he successfully led the Eagles through the playoffs and brought the city of Philadelphia its very first Super Bowl victory. To say the past few weeks have been a case of déjà vu is a gross understatement. Once again, Wentz has gone out with a serious injury (this time to his back), and Foles has taken over. Since that time, Foles and the Eagles have won four consecutive games, including yesterday’s playoff victory over the higher-seeded Chicago Bears. You don’t have to be an Eagles fan–or even a football fan–to appreciate Foles’s accomplishments. It’s more than the classic underdog story. To watch Foles in action is to take a class in leadership with emotional intelligence, the ability to make emotions work for you, instead of against you. Foles’s comments may be inspiring, but they’re also backed up by serious research. For example, Google spent years studying effective teams and found that a single factor contributed most to their success: psychological safety. And great teams thrive on it. That trust in your teammates, the belief that Foles speaks about, doesn’t come easily. But Foles used his experience in yesterday’s game to explain how you can build it. Having admitted that things weren’t going well for the Eagles offensively, Foles gave his defensive players credit for helping keep his team in the game. That trust, that belief–along with a leader who practices what he preaches and has learned how to stay calm under pressure–is part of what has made the Philadelphia Eagles one of the most dangerous teams in these playoffs. And it’s what can help you and your team get the most out of one another–in good times and bad.